sauce: In a small bowl, combine the tartar sauce and desired amount of sriracha. mix and set aside. Cook the crabs: In a wide, shallow bowl, combine the flour, cornmeal, salt, and pepper to taste. Dredge the crabs to coat on both sides. Heat the oil in a skillet over medium-high heat until shimmering hot. Add the butter to the skillet and swirl the pan to melt it. Add the crabs top side down and cook, shaking the pan once or twice, until crisp and browned, about 3 minutes. The crabs may pop and splatter, so be careful. Flip the crabs and cook until crisp and just cooked through (a thermometer inserted into the center of the crab should read 145°F), about 3 minutes more. Transfer the crabs to a large paper-towel-lined plate. Assemble the sandwiches: Spread the tartar sauce onto each side if the buns. Top one side of the buns, sauce side up, with a piece of lettuce and 1 or 2 slices of tomato. 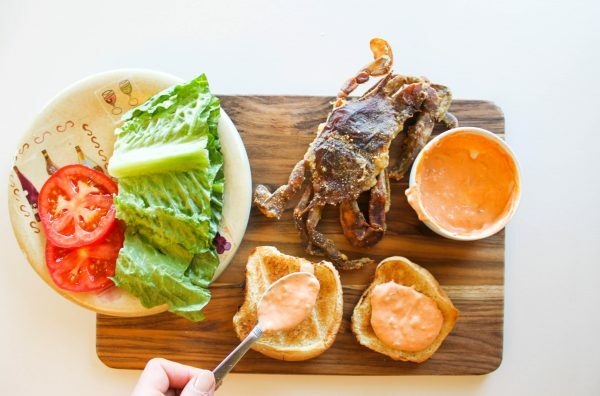 Put one crab on each sandwich, top with the remaining toast, sauce side down, and serve.